(Saranac Lake) I’m a fan of Disney animated movies: good overcomes evil with a few plot twists, great songs and some underlying adult humor. 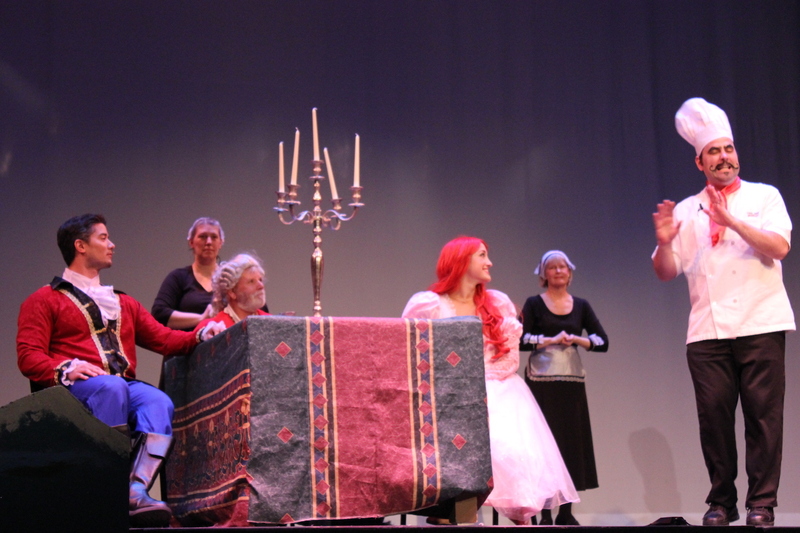 Last night I was fortunate to catch the dress rehearsal of The Community Theatre Players’ (CTP) performance of Disney’s The Little Mermaid. 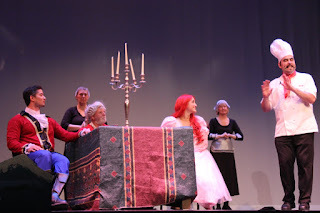 CTP has created a magical kingdom that transports the audience from an ocean of familiar characters to Prince Eric’s kingdom through their exquisite voices, imaginative sets, complex costumes and a sea of body puppets. The word puppet is too limited a word to use. Sorensen and a team of people have merged costumes with puppets to blend actors into their characters. Similar to the work of Julie Taymor in Disney’s The Lion King, these hand-built puppets add charm to an already enchanting evening. 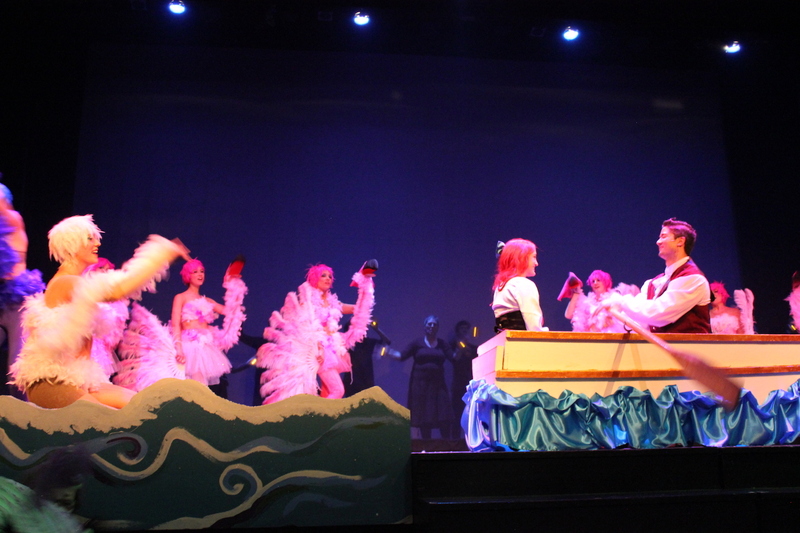 Directed by Matt Sorensen with choreography by Terpsie Toon and musical direction by Kimberly Weems, “The Little Mermaid” gathers a cast of local talent ranging from grandchild to grandparent for a breathtaking performance. I left the auditorium selfishly grateful that the people on stage choose to live here. For those aficionados of the 1989 Disney animated film, this production won’t disappoint. It will make your heart sing and perhaps help you find your own voice. Don’t expect a complete staged rendition of the movie. There are a few story alterations necessary to bring this musical adaptation to the stage. Don’t worry, Ariel still yearns for a life above the sea. After saving Prince Eric from a watery grave, she makes a deal with the evil Ursula, who has been banned to the depth of the ocean. Ariel is willing to trade her voice for legs in her search for love. Ariel also becomes more empowered as she discovers life above the ocean. With that also comes new music and over 30 songs. Though each member of the ensemble smoothly dances their way into our hearts, it’s the charismatic voices of Ariel (Olivia Zeis) and Ursula (Matt Sorensen) that have us riveted to our seats. Zeis as Ariel is stunning. Every note she sang brought shivers up my back. Last seen as Dorothy in the CTP’s version of “The Wizard of Oz,” her Ariel approaches life with wide-eyed wonder. She will make even the most hard-hearted soul appreciate the magic in the everyday. In addition to directing, Sorensen is magnetic as the evil octopus Ursula. His cunning portrayal of King Triton’s (Lonnie Ford) nemesis takes advantage of Ariel’s naivety with the ease of an evil laugh. Laughter bubbles from the audience as Ursula belts out a sultry rendition of “Poor Unfortunate Souls” all the while pandering to sidekicks Flotsam (Lucky Cerutti) and Jetsam (Dylan VanCott). I’d be remiss in not mentioning the performances of Bren Gotham as Chef Louis and Peter Curtis, as Sebastian the crab. Singing one of the show’s most popular songs, “Les Poissons,” Gotham brings flair to a superb performance. 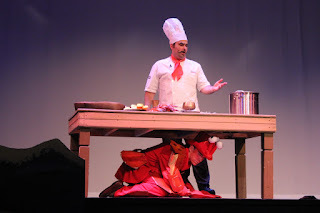 There are also plenty of laughs and a bit of slapstick with dancing chefs as Sebastian tries to avoid becoming a royal meal. Curtis never breaks from his Jamaican accent whether he’s singing and worrying about keeping Ariel away from the humans. 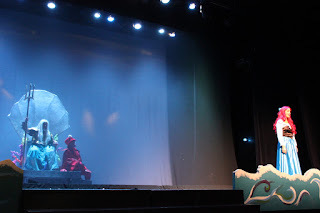 Curtis’s voice is captivating as he entices Prince Eric (Ryan Carrier) to “Kiss the Girl.” This is where the set, props and use of body puppets really shines. A row boat seemingly glides through water while all the animals come out to help serenade the royal couple. Dancing flamingos, clown fish, seahorses, and clams are just a few of the puppets and costumes used to draw us into this imaginary kingdom. 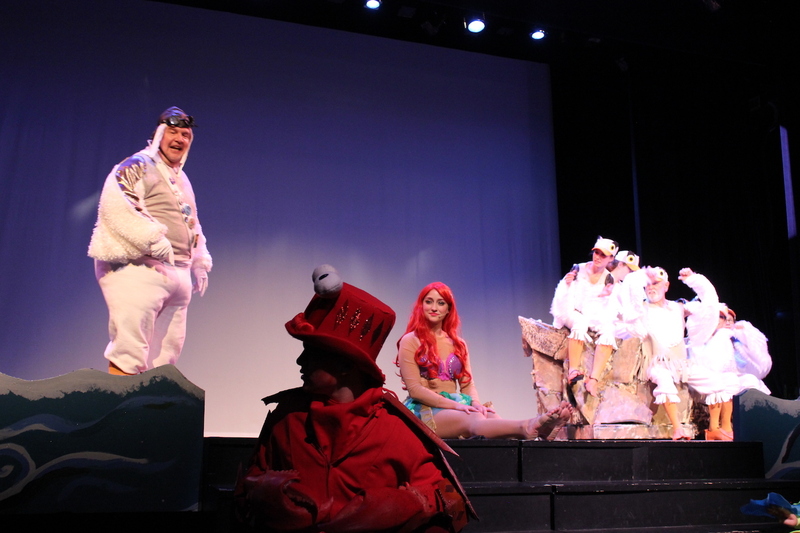 There are too many clever nuances to list, but a few fun highlights to look forward to are Scuttle (Jason Brill) and his tap dancing gulls, the heelies used by the mersisters, Flounder (Morgan Olsen) and Ariel for “swimming” around the stage. Also look for a few cameos from some popular Disney princesses. Just like every Disney movie or play, this performance is for all ages. Bring the kids, grandparents or go on your own. Any way you want it served, you’ll enjoy this ocean of talent. Don’t wait, dive right in. 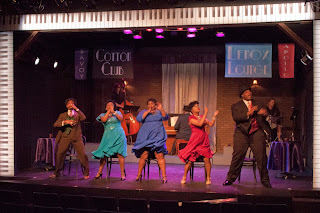 Opening night is tonight, May 20 at 7:30 pm. Enjoy! 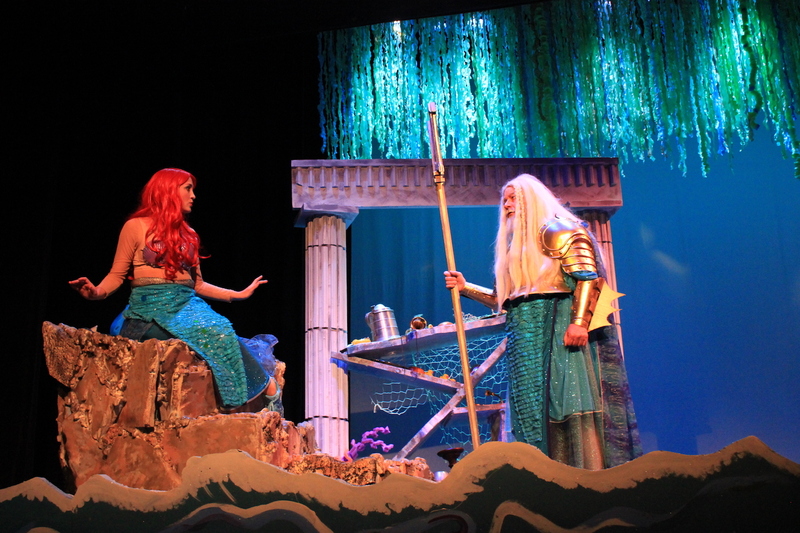 When: May 20, 21, 27, 28 at 7:30 p.m. and May 22 at 2 p.m.
What: This musical is written by Doug Wright with music by Academy Award winner Alan Menken and lyrics by Howard Ashman and Glenn Slater. The Little Mermaid follows the adventures of mermaid Ariel’s on her quest to join the human world after saving Prince Eric at sea. She encounters trouble from her father, King Triton, as he blames humans for the death of his wife, Ariel’s mother. Ariel makes a deal with the devil in the form of the evil octopus Ursula and trades her voice for legs. Will she make Prince Eric fall in love before her three days are up or will she turn into sea foam?